The other day I showed you a gift wrapped present for a friend’s 40th birthday. Today I’m going to show you the card I made him. 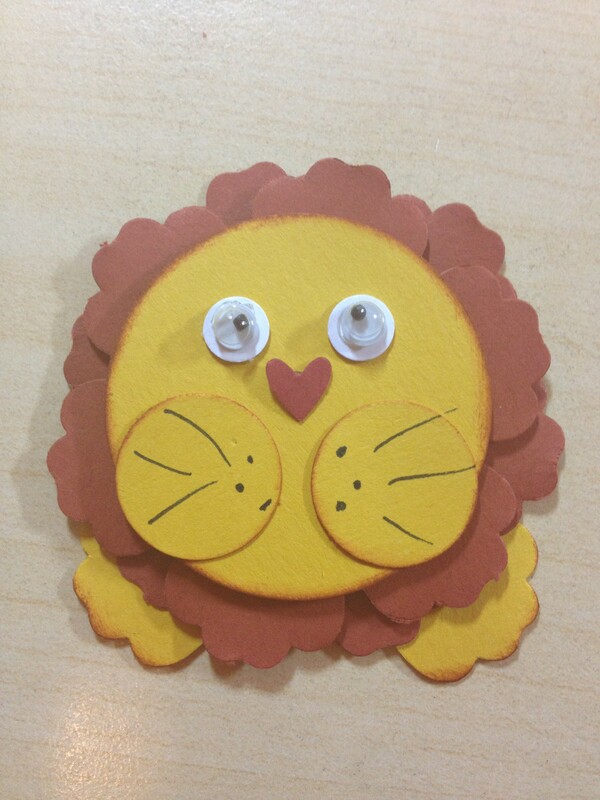 This friend is a big Brisbane Lions fan – so of course my little man decided that he needed to have a lion card made in Brisbane Lions colours. A creative challenge for someone who has no idea about AFL! 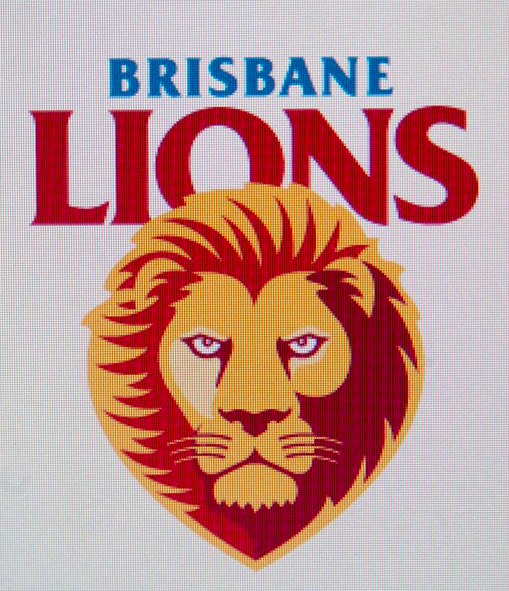 First step in the creative process: Google to see what the Brisbane Lions logo looks like! Second: figure out the Brisbane Lions colours. I went with Pacific Point, Crushed Curry and Cajun Craze from Stampin’ Up! Step 1: punch 2 flowers from the Blossom Punch in Cajun Craze. 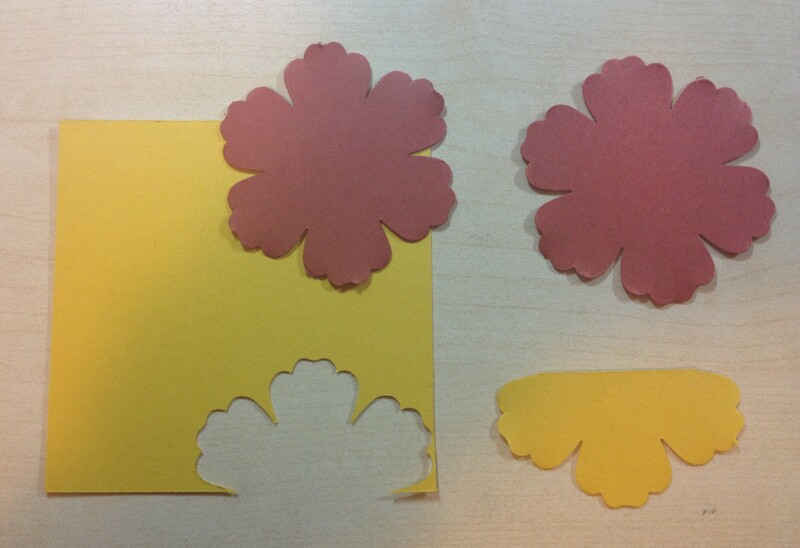 Then punch out 3 petals from the Blossom Punch in Crushed Curry. The Cajun Craze pieces will be the mane and the Crushed Curry will be the lion’s paws. Step 2: punching pieces for the face. I used a 1 3/4″ circle for the face and 2 x 3/4 inch circles for the cheeks. 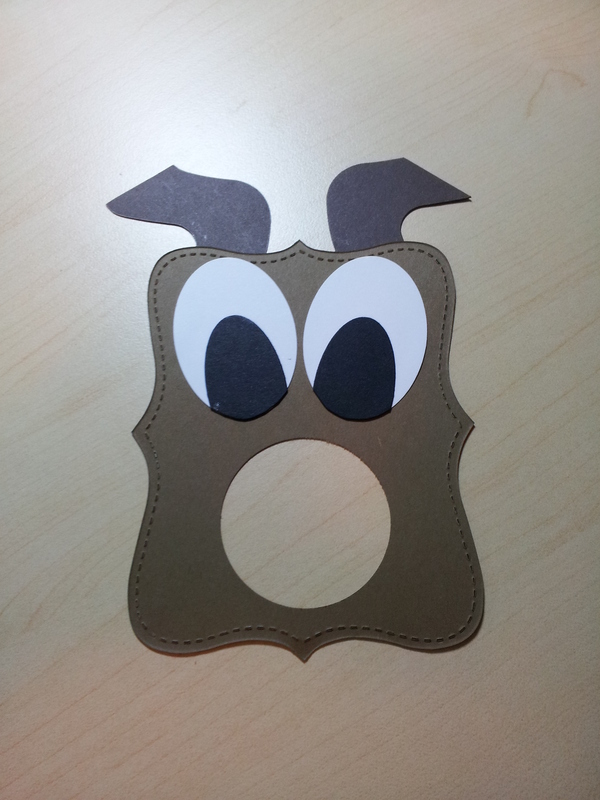 I cut the eyes and nose using the Owl builder punch. Step 3: assembling the lion!! I stuck the 2 Cajun Craze pieces together using dimensionals so the second layer of the mane had some height. I then stuck the 1 3/4 circle on top and stuck on the pieces for the face. I added goggley eyes for a bit of extra cuteness. You could also use black eye centres from the owl punch, or even just draw black dots with a pen. This worked well as 2 lion paws. I used a sponge dipped in Cajun Craze ink to dab around the paws and face for a little extra colour. A black pen for the whiskers and freckles and I was done. 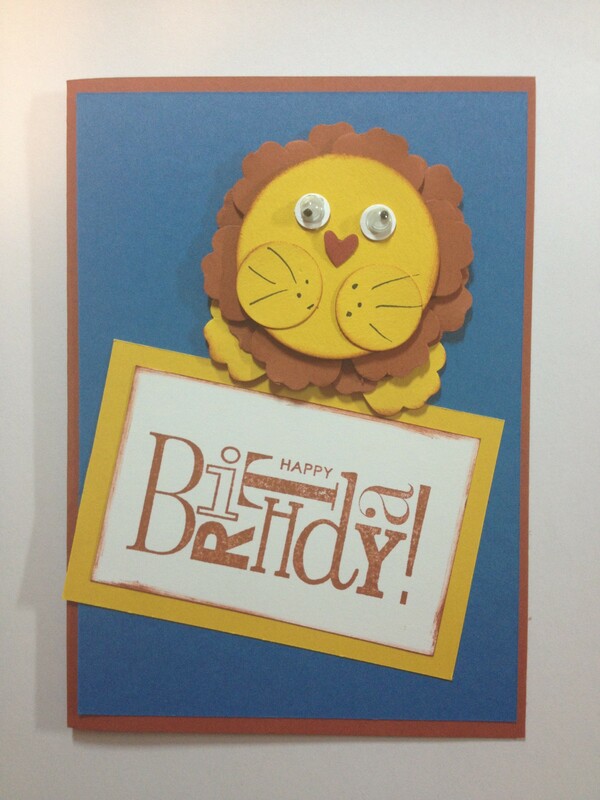 I matted a Happy Birthday greeting in Cajun Craze on a Crushed Curry background and put it on an angle so it looked like the lion was holding a sign with its paws. 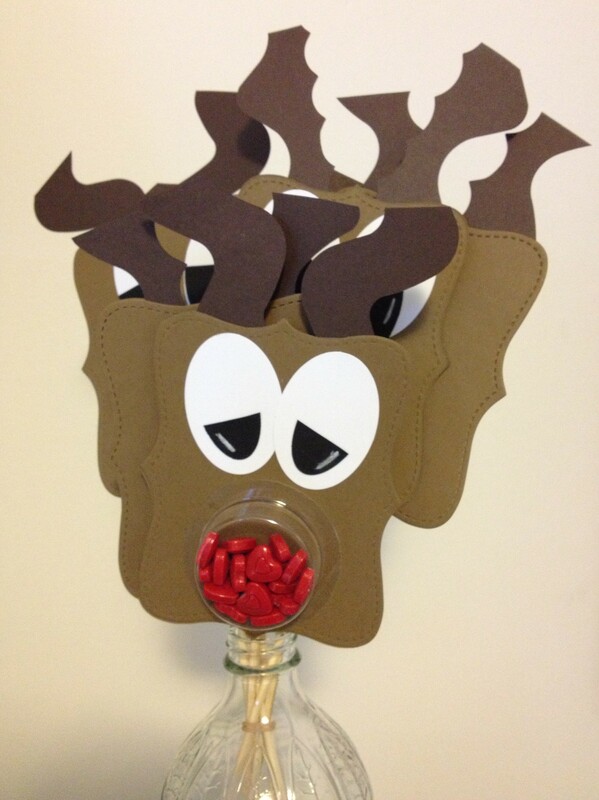 The other day I showed you some Rudolph the red nosed reindeer decorations I made using Stampin’ Up! sweet treat cups. 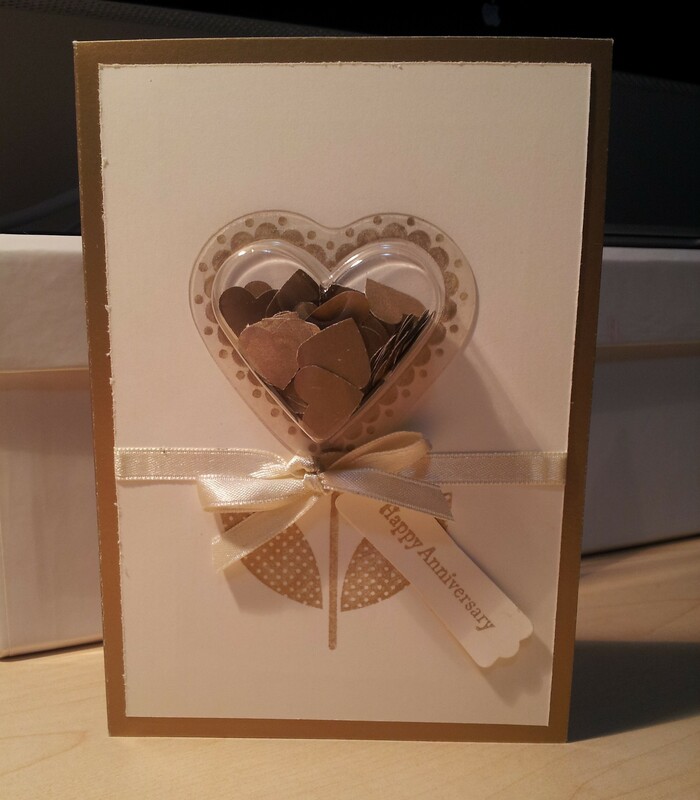 Today I wanted to show you another card using sweet treat cups – a card I made for some very dear friends’ golden wedding anniversary last year. 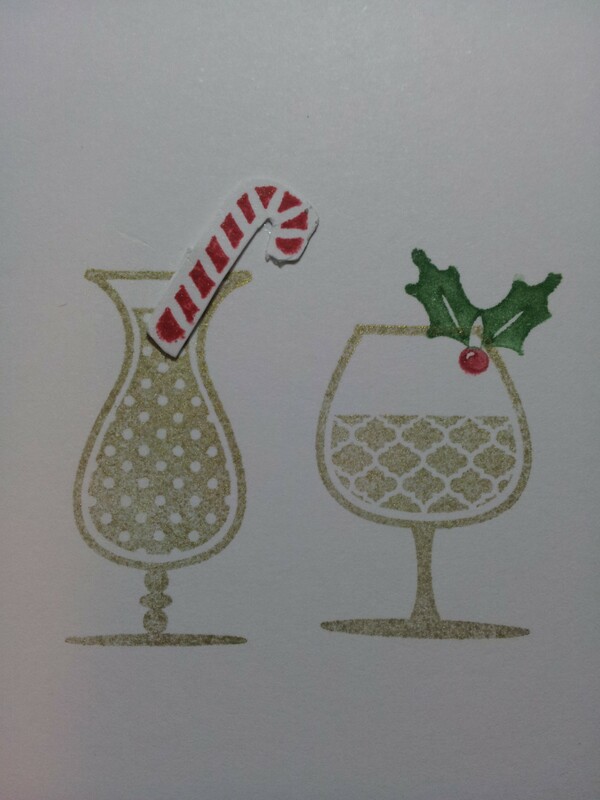 I used gold card stock and ink and Very Vanilla for the stamped image. The tag used the Modern Label punch and a greeting from the Teeny Tiny Sentiments set. I used my Small Heart punch to punch out lots of little gold love hearts for the inside of the cup. This card is made with retired products (Sweetheart stamp set for the flower and heart border as well as the heart treat cups), but you could make a similar card using the round sweet treat cups as a flower. I’m looking forward to someone having a major anniversary soon so I can make this card again! One of my favourite things to do is wrap a present. I don’t know why, but something about choosing colours and playing with ribbon is very therapeutic. And we are all about making things pretty here at Caro’s Pretty Things! We recently went to a close friend’s 40th birthday party. He is just a little bit into red wine (understatement of the year!) so of course we bought him a very nice bottle of red wine for his present. Here’s the present all wrapped up. 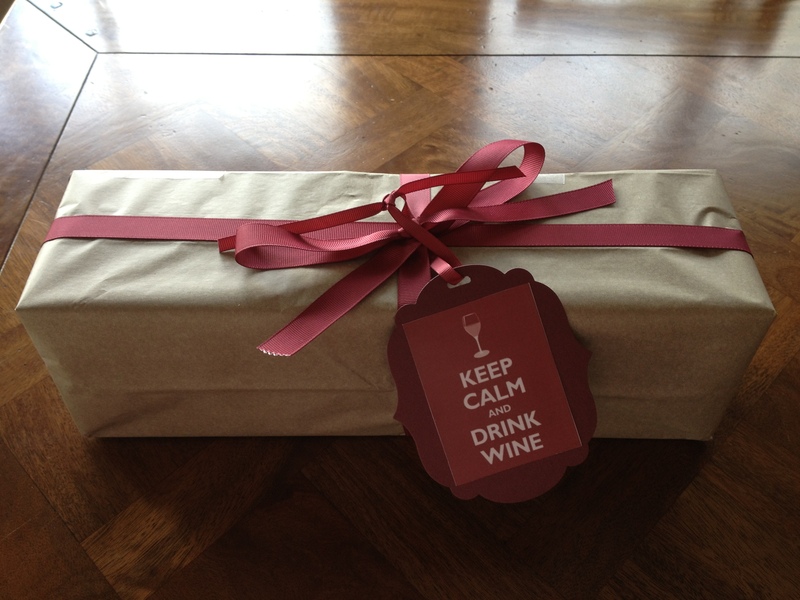 I used my Labels collection framelits for the base of the gift tag and printed out an image ‘Keep Calm and Drink Red Wine’ I found on the web. 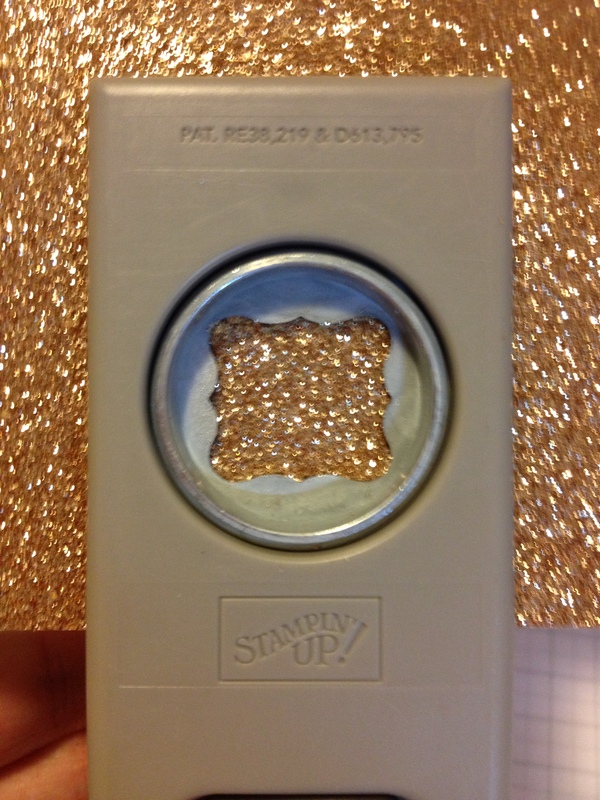 This was tied on with Bravo Burgundy ribbon from Stampin’ Up! (the same colour as the die cut label) – which seemed rather appropriate given the gift. Hopefully he’ll enjoy the wine as much as I enjoyed wrapping it! 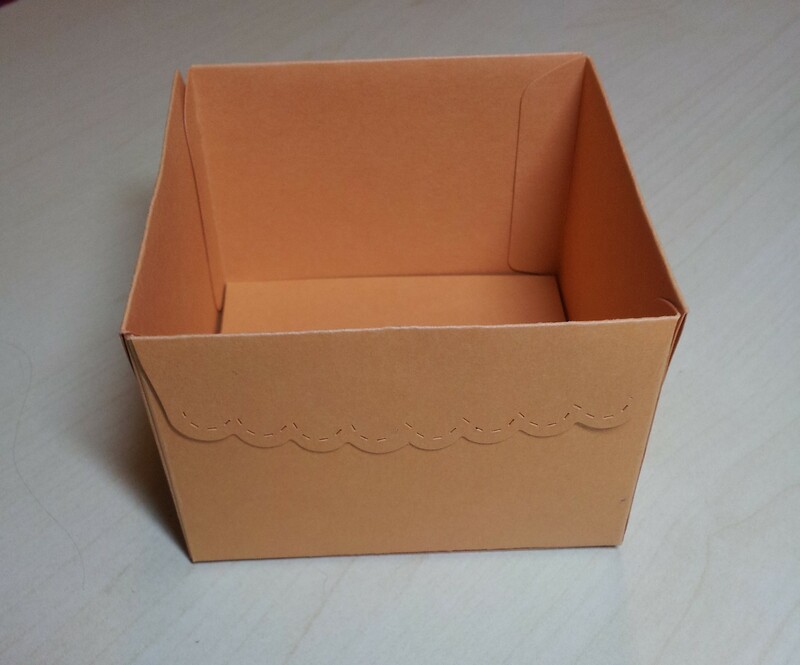 Today I wanted to show you a little gift box I made for a present. 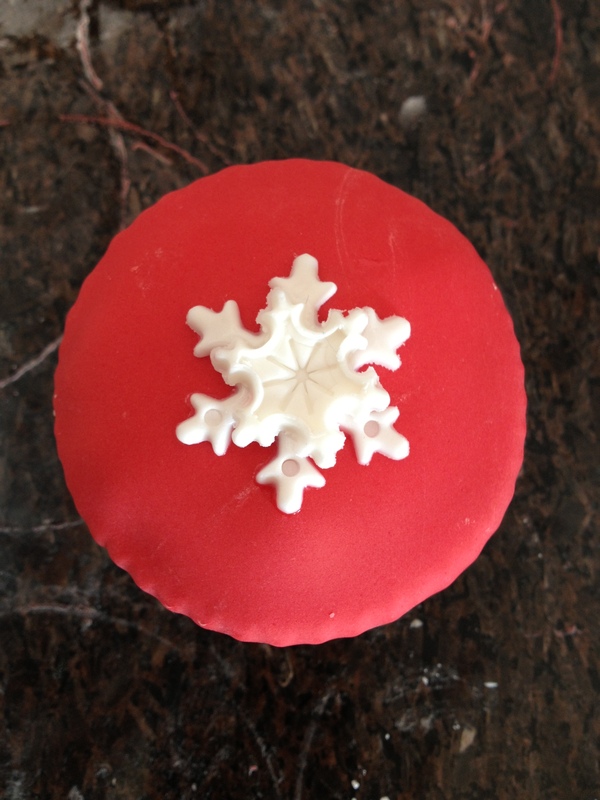 Anyone who has been reading this blog lately would know we recently had a Christmas in July (in August!) party at our house. We had a Secret Santa and one of the recipients loves orange (he says it’s his signature colour!). 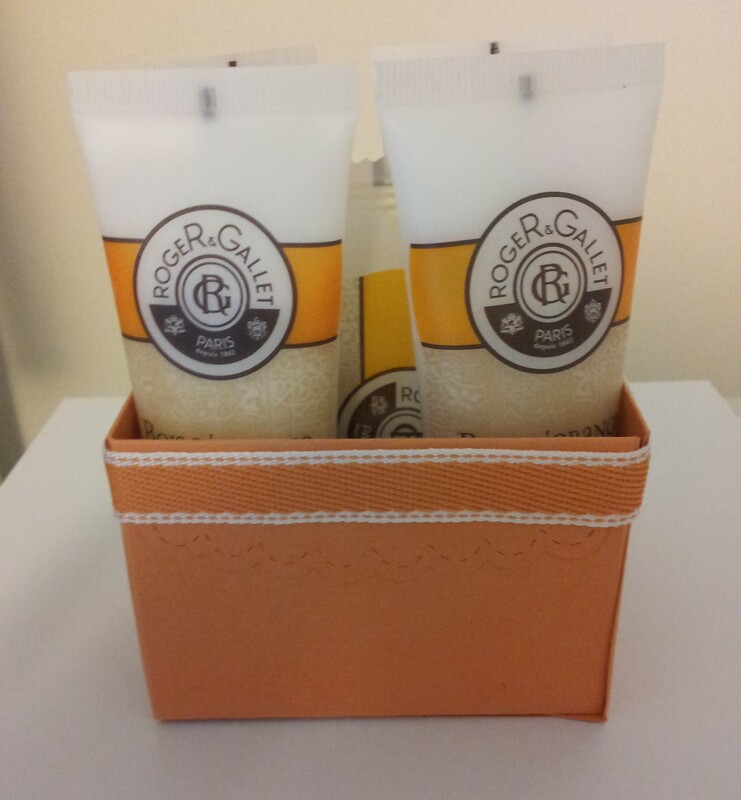 I found some orange travel toiletries and wanted to make a little box to present them in. I made this little box using the Stampin’ Up! scallop envelope die. 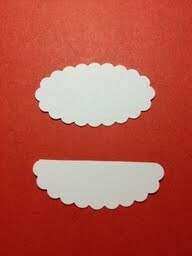 You will need 4 pieces cut from the scallop envelope die to make the box. 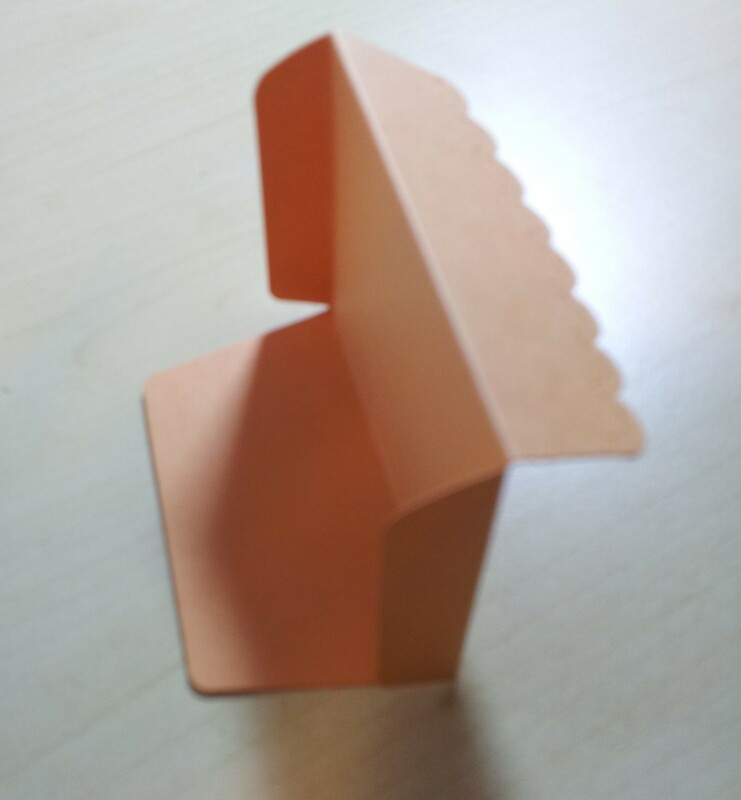 You will also need one piece of card stock for the base of the box measuring 8 cm x 8 cm. 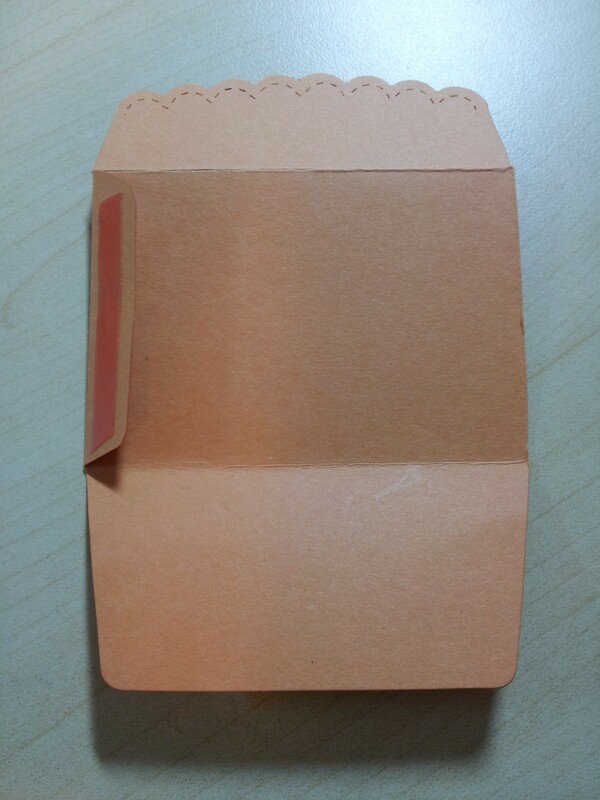 Step 2: cut one side flap from each envelope. It doesn’t matter which side you choose – just make sure that you choose the same side on each piece! Step 4: stick the 4 pieces together to make a long row, as shown. I could only fit 3 in the picture but you need to stick all 4 together in a row. I also like to glue down the scallop edges, but I have also made the box leaving them as ‘flaps’. Step 5: fold in the base flaps to make the bottom of the box and stick the remaining sides together. 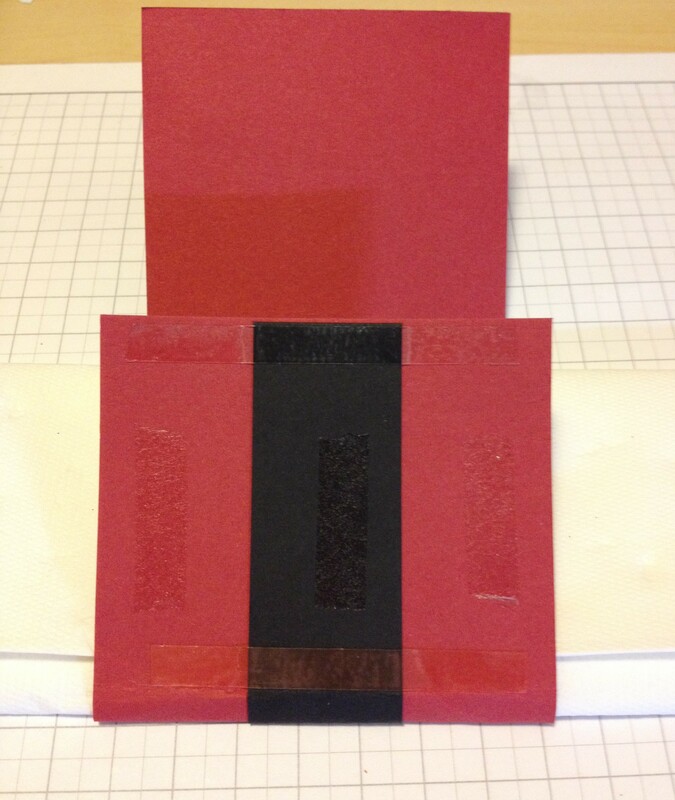 Glue the square of card stock to the base for extra strength. I also glued some ribbon around the top for extra decoration. This is also a great sized box for storing things on your desk. Post it notes fit really well! 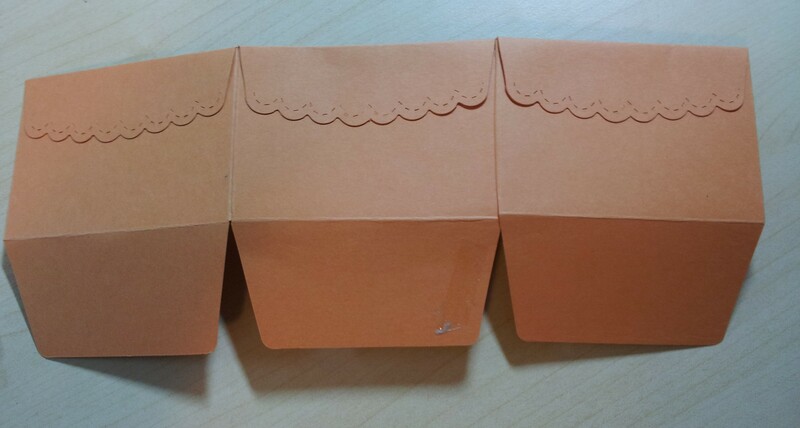 If you don’t have the scallop envelope die you could try making a box using 4 of a normal envelope template. There are lots of printable templates available on the web. This is my last post showing you things I made for our recent Christmas in July in August party. I promise! Today I’m going to show you cute stuff we made to eat. 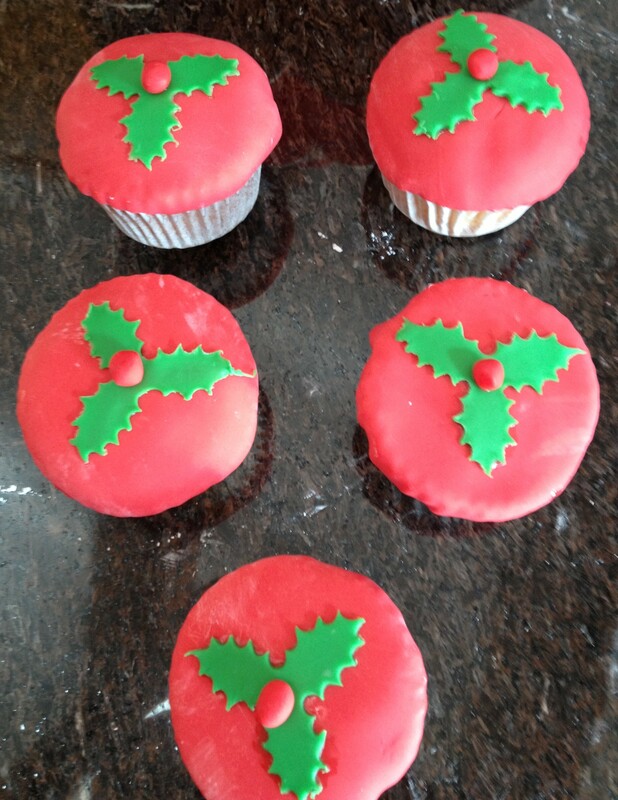 First up – some Christmas themed cupcakes! My son and I had a ball decorating these. 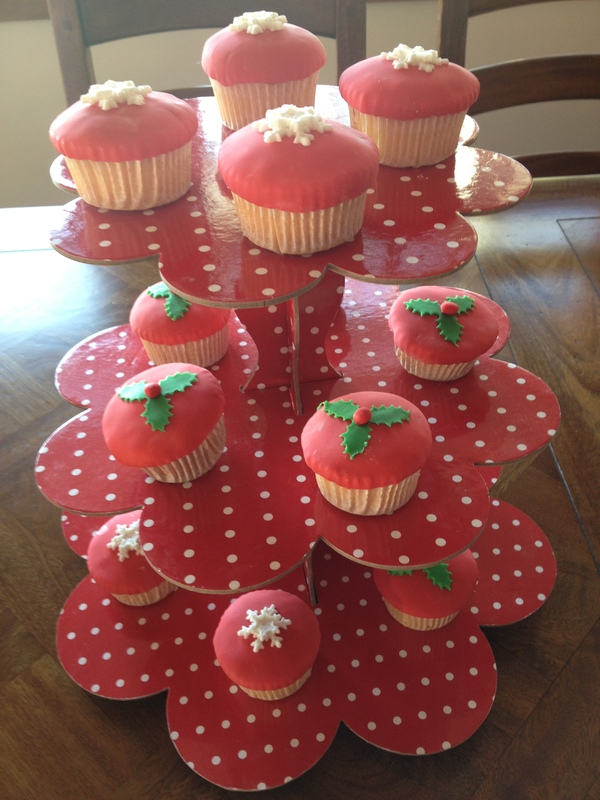 He made all the red berries and painted on the water to glue the decorations to the top of the cupcakes. 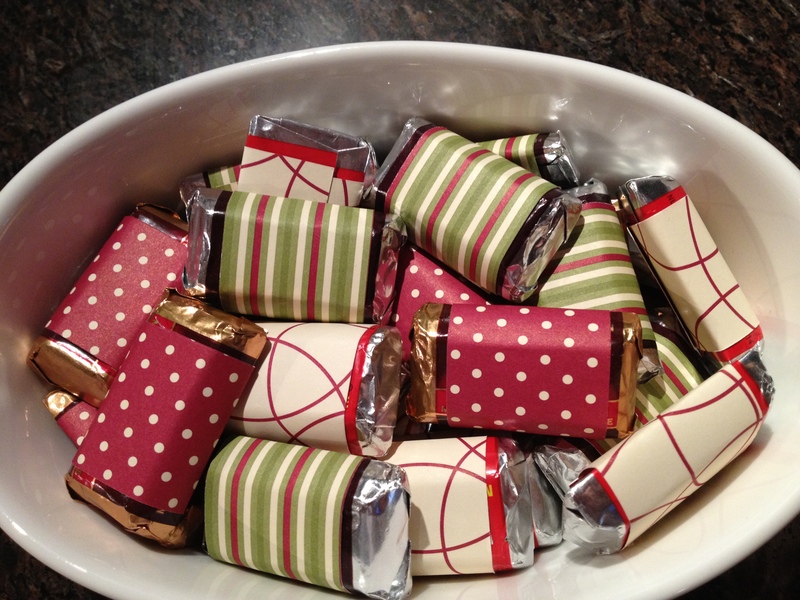 Next up – some paper wrapped chocolates! I have seen so many blogs from the US showing papercraft ideas and presents with Hershey’s chocolates wrapped in DSP – and I’ve always wanted to try my hand at making some of those beautiful creations. And I don’t even like chocolate! I was standing in line at the Reject Shop the other day – and what did I spy but some Hershey’s chocolates. That was the first time I’ve seen them in Australia. I ran out of time to do anything too fancy with them, but I did use up some scraps of old Jolly Holly DSP I had lying around to make them pretty Christmas chocolates. 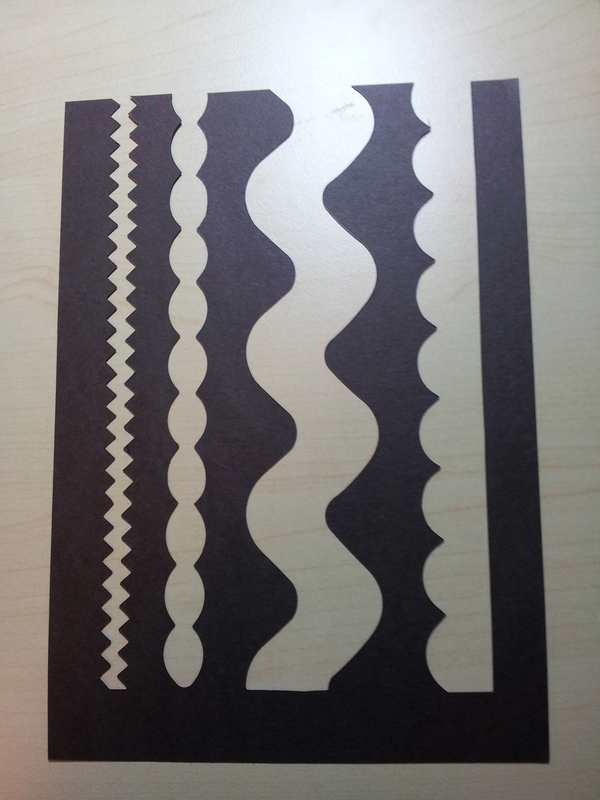 I cut strips 3cm x 7.5cm. This meant you could still see the foil and a little of the wrapper. Next time I’d probably do 3.5 x 7.5cm. 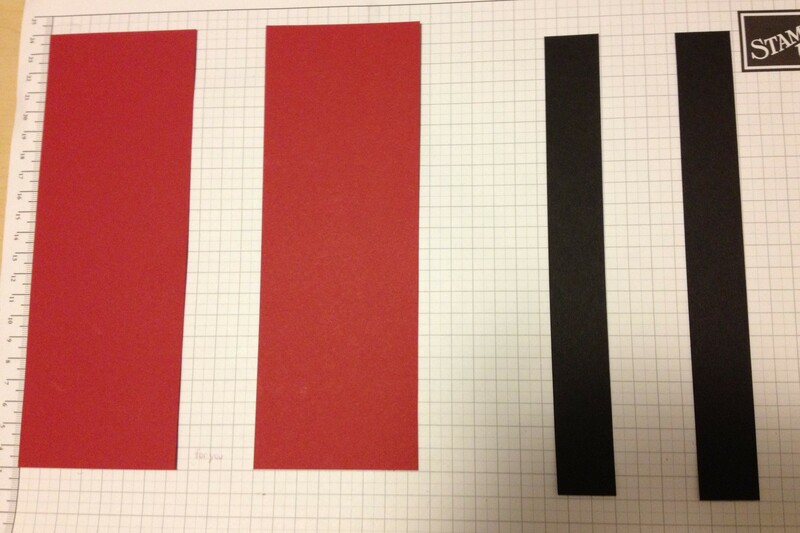 7.5 cm is a really handy length as you can cut four pieces from a single strip from a 12 x 12 ” sheet of DSP. Now that I know you can get these in Australia I might have to revisit some of those blog posts! Yesterday I showed you the Rudolph decorations I made for our recent winter Christmas weekend. 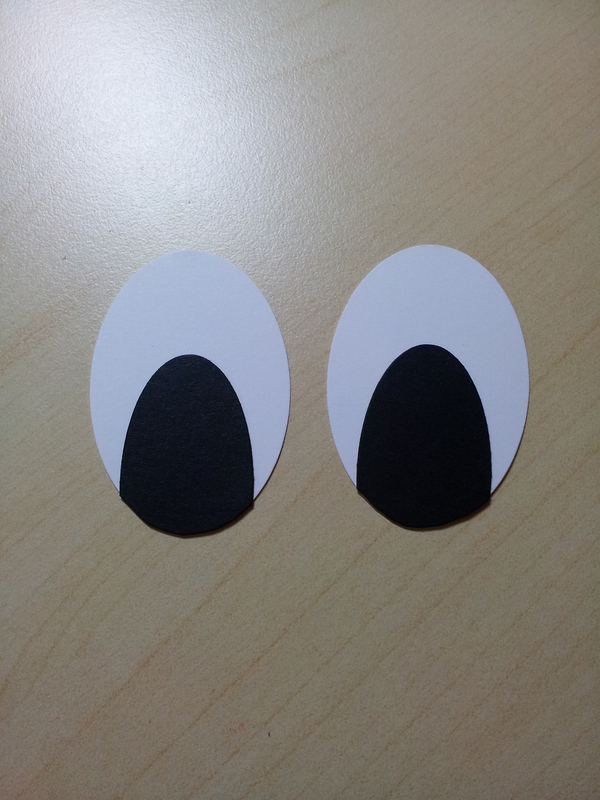 Today I wanted to show you how I made the eyes. 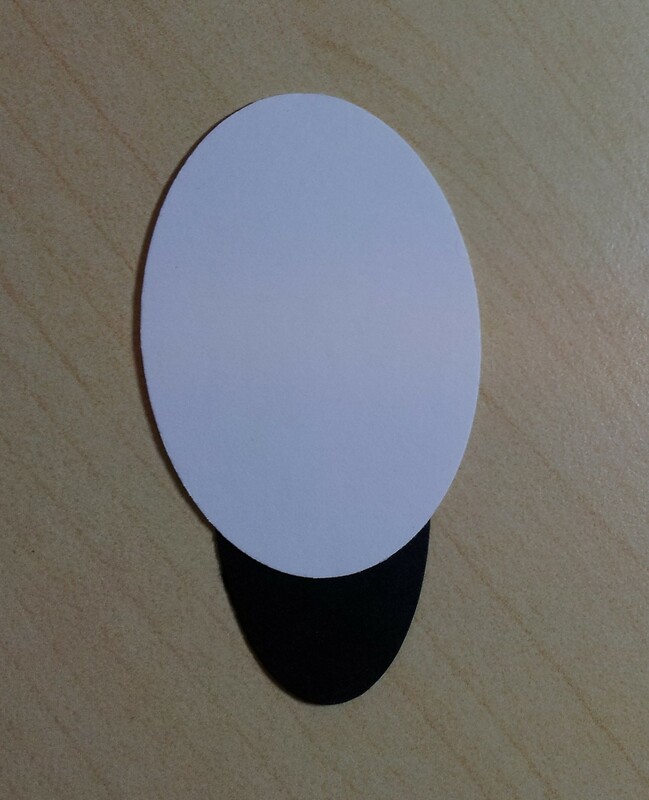 At first I used my large oval punch, cut 2 white ovals and 1 black oval, cut the black oval in half and stuck the black bits over the white bit. These looked quite fine, but a little too small in proportion to the face (made from a top note die). So I used my extra large oval punch to cut the white and the large oval to cut the black, and trimmed down the black section. 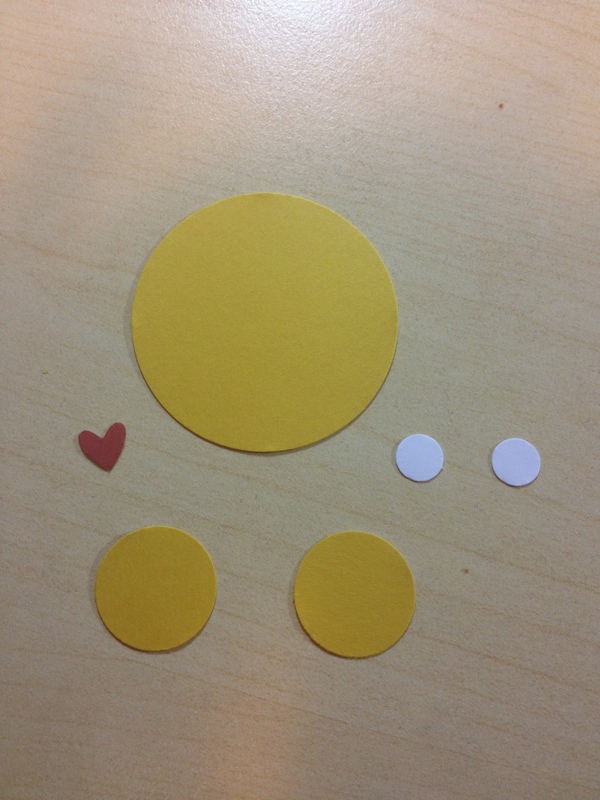 Step one: Cut 2 white extra large ovals and 2 black large ovals. 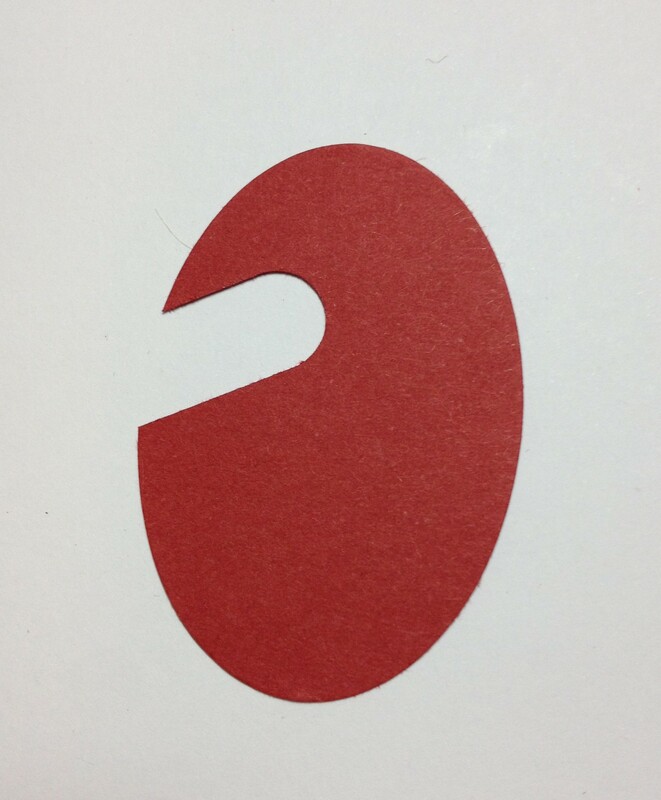 Place the black ovals over the white until the proportions look right. Stick the black down with the rest of the oval hanging over the bottom. Step 2: Flip the eyes over so you can see where to trim the black. 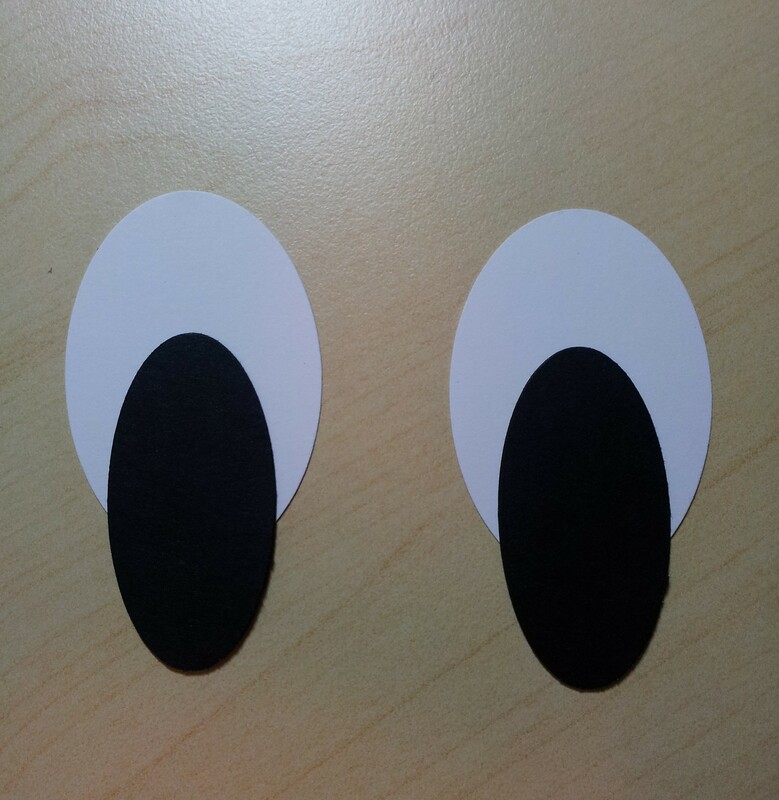 Step 3: Turn back over and voila – eyes! At this point I also use a white pencil or Signo pen to add a little white line in the black. I forgot to take a photo of that step, but you can see this detail in the photo above. Anyway, I hope that gives you some ideas as I found working out the eyes a little more ‘fiddly’ than I’d expected! You’ll have seen from my last few posts I may have gone a little overboard on the decorations for our Christmas in July (in August) weekend? I have another type to share with you today! 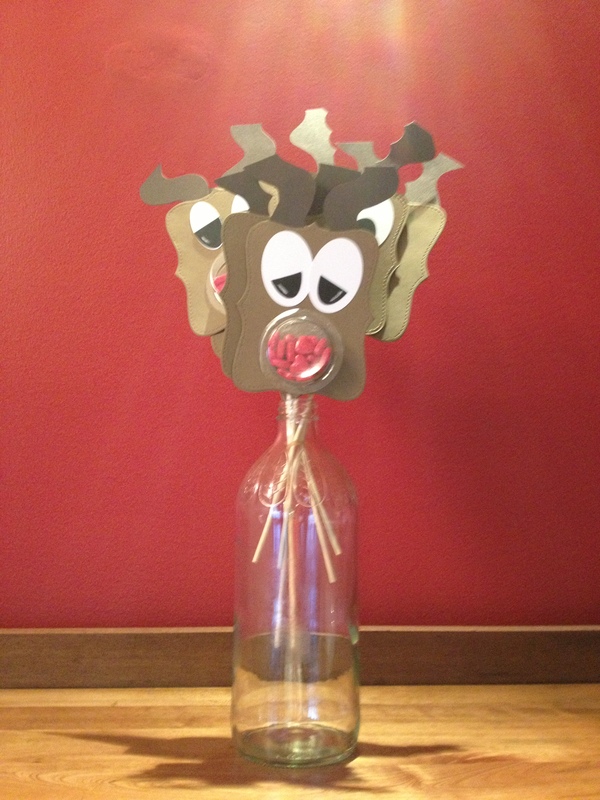 As part of my “research” I came across this Rudolph ornament by Marie Shaughnessy using Stampin’ Up’s sweet treat cups. My husband also bought me some red heart shaped lollies during the week, which got me thinking of red noses and Rudolph and what I could do. 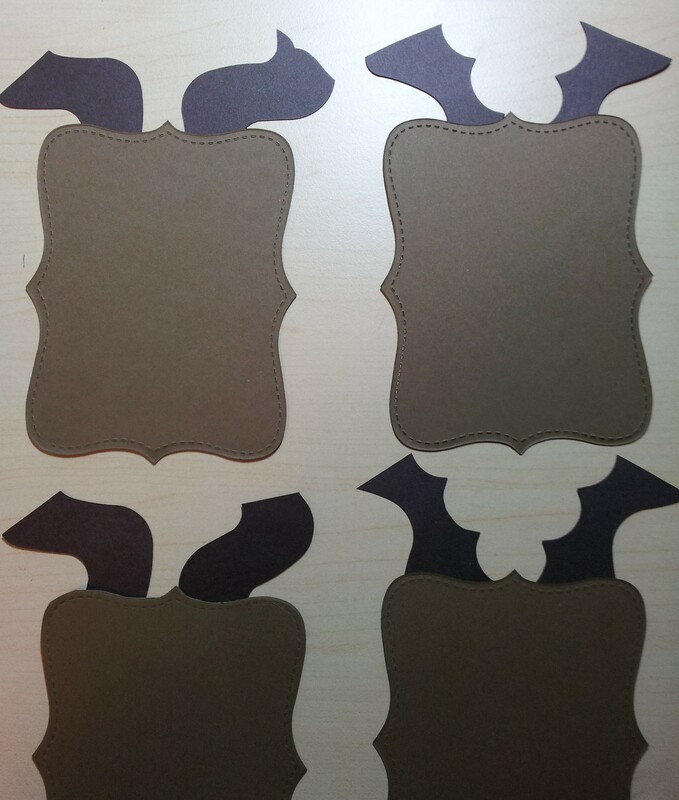 The faces were made of a Top Note die cut out of Soft Suede card stock. I cut 2 for each Rudolph. 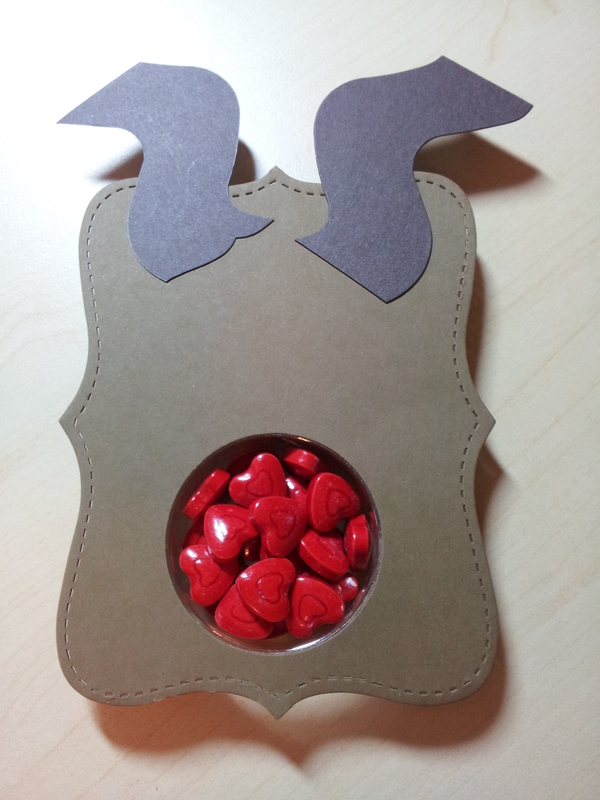 I was hunting around for things that could work as antlers and thought about using my Tasteful Trim die. When I cut it out however, I actually thought that the spaces between the cut out trim might actually work better as reindeer antlers than the trim itself! They all looked a little different. I think the one on the bottom left probably looked the closest to real antlers? 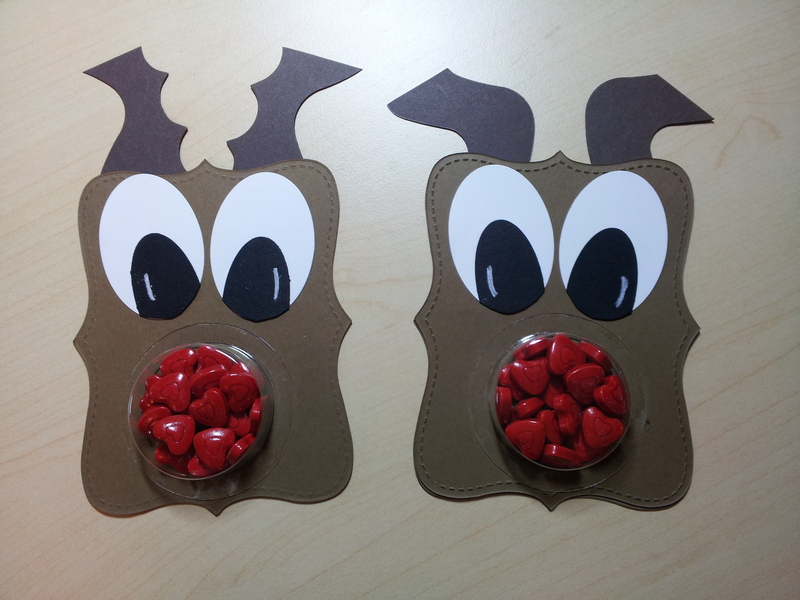 I then stuck another top note on the back of the first one to hold the lollies in – and ta da, some Rudolph the Red Nosed Reindeers! I used an A4 piece of card stock as the red backing (using up some retired Riding Hood Red card stock) and a white piece of A4 where I’d cut 2cm off one long and one short side (ie, to get a 1cm border around all 4 sides). 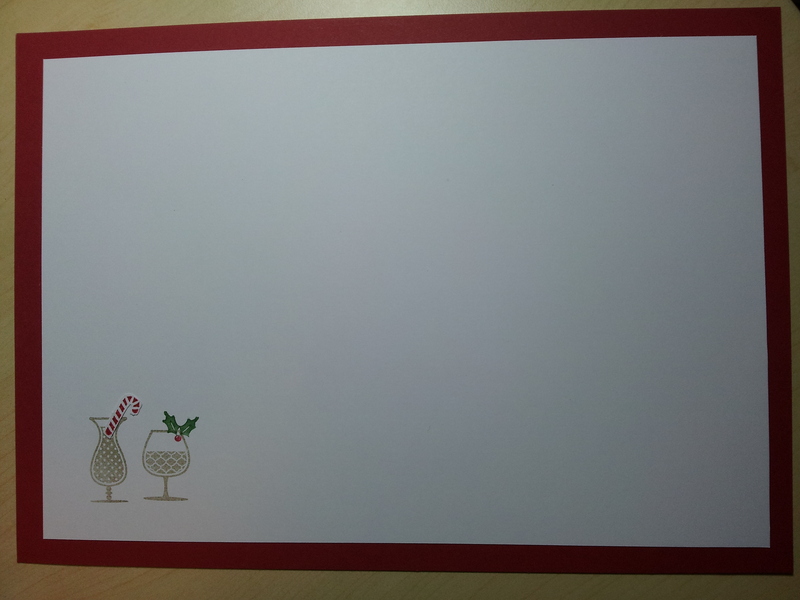 I then stuck the white and red card together and ran them through a laminator to make the place mat. They looked really cute all lined up together! 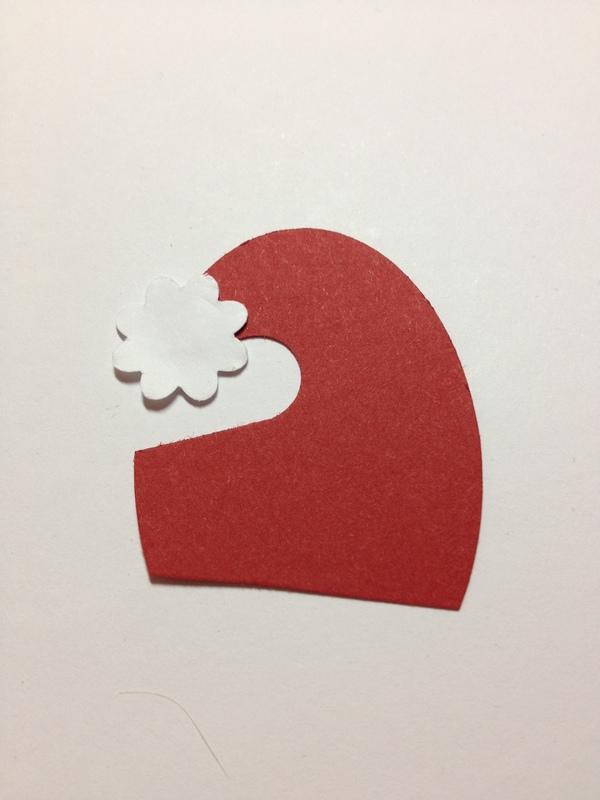 PS There may be a few more Christmas craft details to show you – stay tuned! 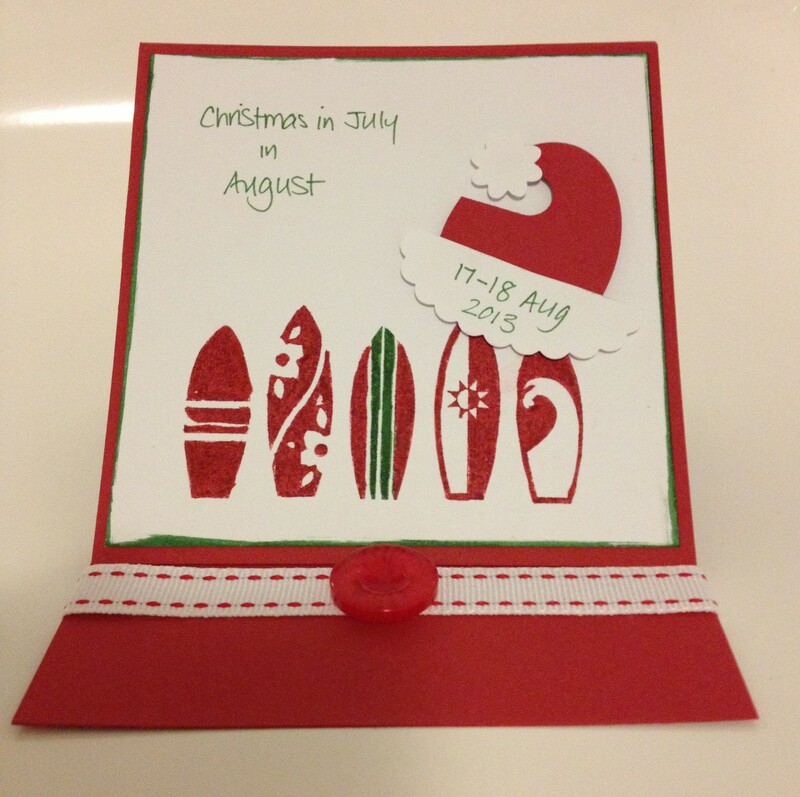 The last two posts I’ve showed you some of the craft I did for our recent delayed Christmas in July party. 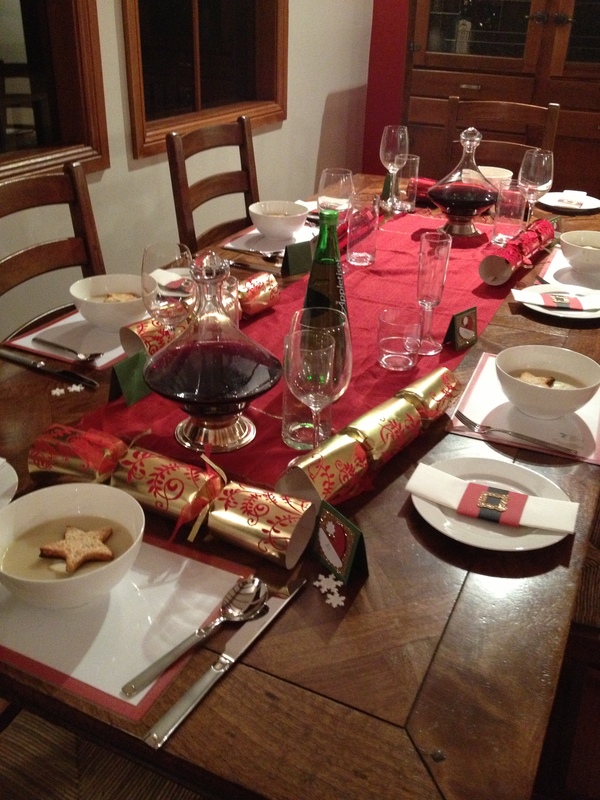 Today I wanted to show you some more table decorations – this time Santa napkin rings! This idea came about when we were in a Christmas shop looking for Christmas crackers for our party. I was looking at a Santa belt decoration and thought that it would make a great napkin ring. I then went home and pulled out my punches to see whether I could come up with something similar. The starting point was trying to figure out how to make the belt. 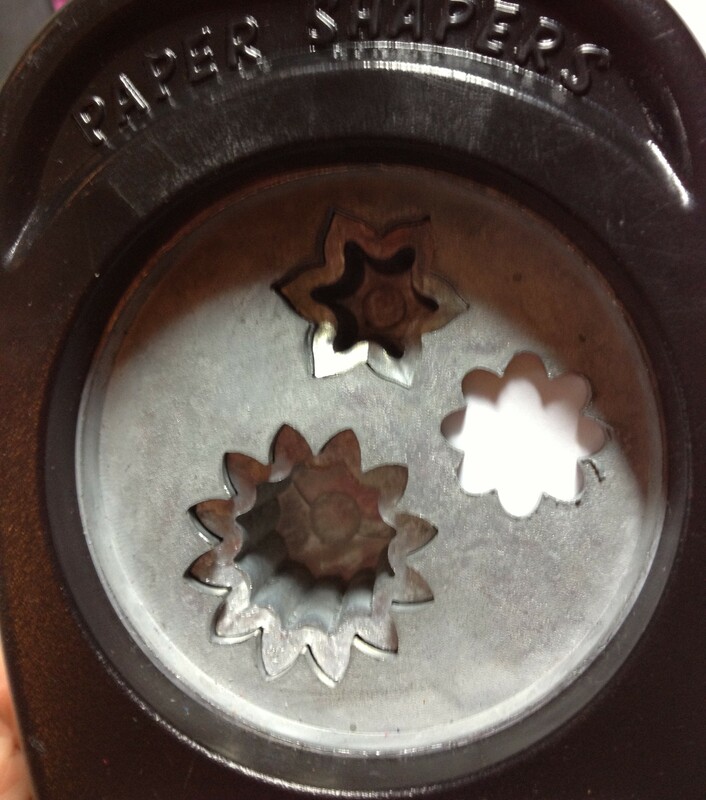 I tried my square punches and the decorative label punch but they weren’t quite right. 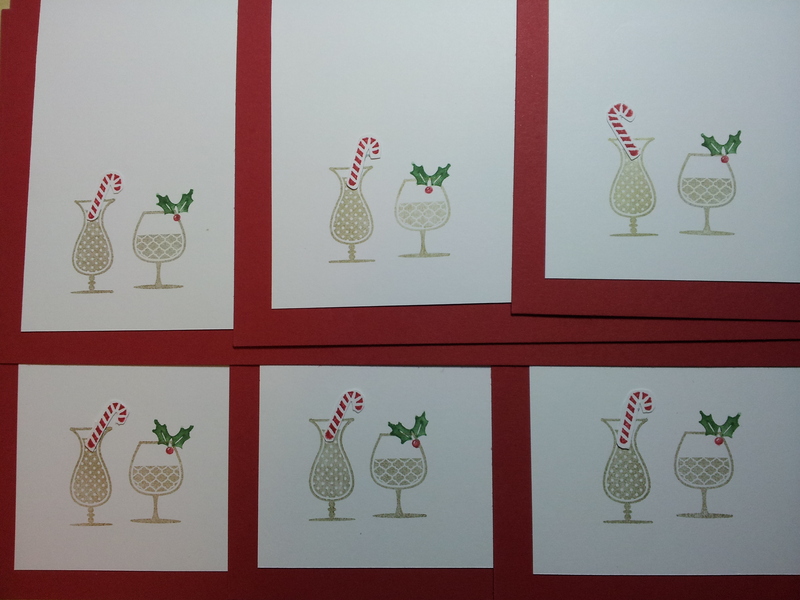 I then hit on the petite curly label and the curly label punch and they were perfect (all punches are by Stampin’ Up!). 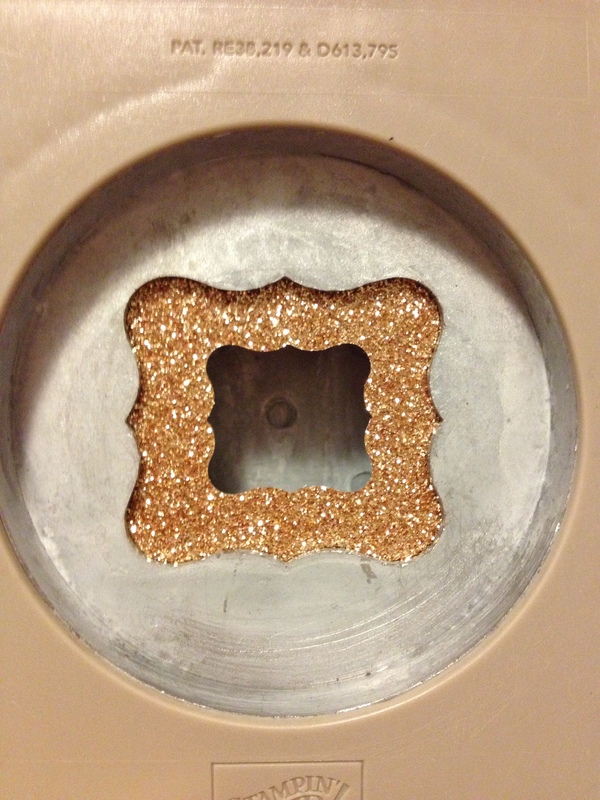 And hey presto – Santa’s belt buckle made out of glittery glimmer paper! I then had to figure out how to make Santa’s shirt and belt. I started out with a napkin and my pile of Riding Hood Red offcuts to see what width of red looked right with the buckle in the middle. I ended up with a red piece 7.5cm wide and 21cm long. After a bit of fiddling around trying to work out whether to thread the black through the belt or not, I decided it would look best (and be easier!!) to just stick the buckle over the top of the belt. 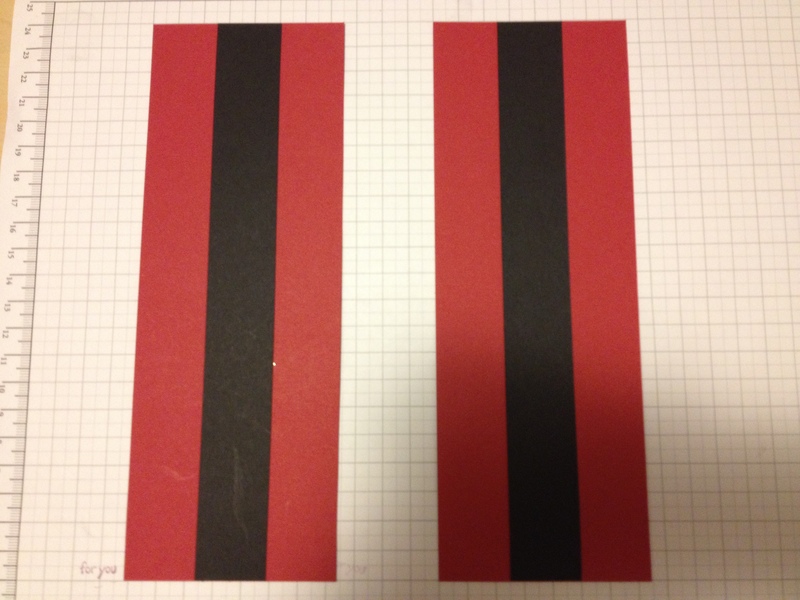 So the black strip for the belt needed to be slightly narrower than the buckle, which worked out to be 2.5cm wide and 21 cm long. 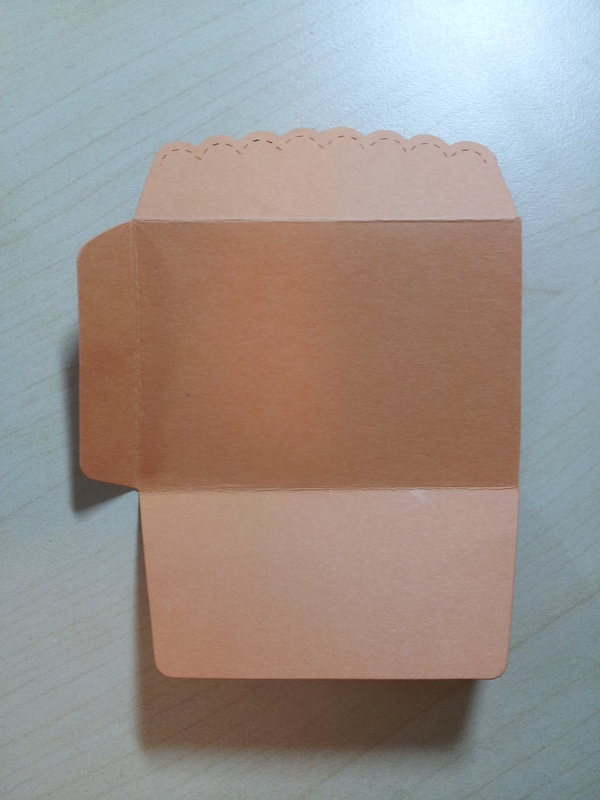 I then folded a napkin into thirds and wrapped the card around so it was just slightly loose and stuck it down. I used both sticky strip and snail adhesive to make sure it stayed stuck! 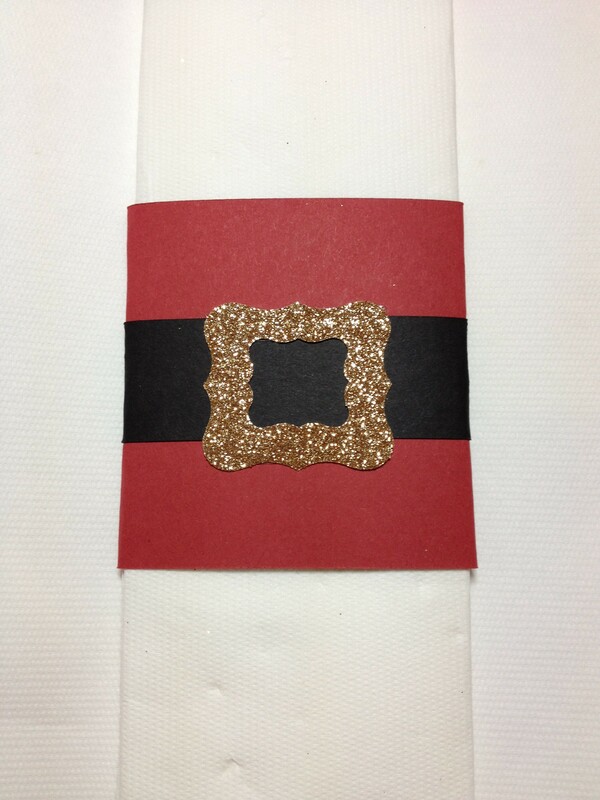 I stuck the buckle over the belt and “ta da” – a Santa napkin ring! They looked very cute all lined up together. 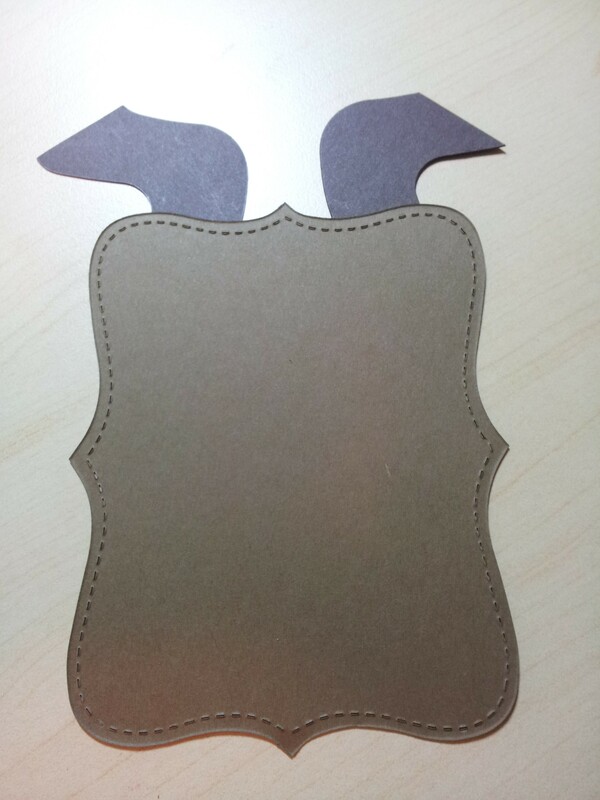 I think something like this could also work as a belly band on a gift card holder or gift box as well. Perhaps just the black belt and buckle wrapped around a red box/card? I must say I’d never thought of making a napkin ring out of card stock before! Funny how inspiration strikes in the strangest places. I’m now starting to think about ribbons, flowers, brads … I need to throw some more dinner parties to come up with new decorating ideas! Yesterday I showed you my Christmas in July (in August!) 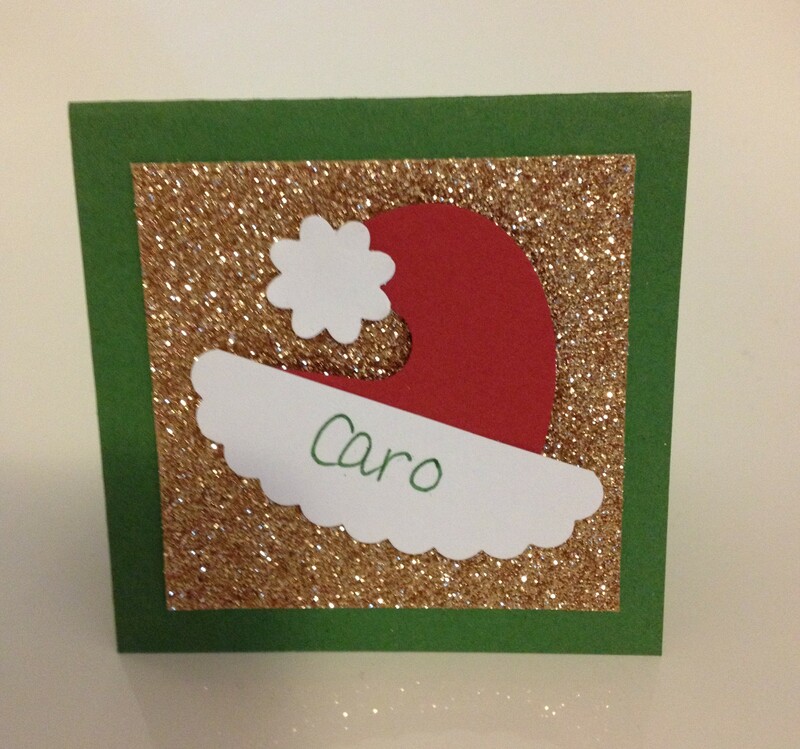 themed easel card with a cute little punch art Santa hat. 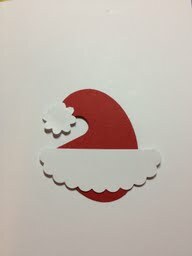 I got the idea for the Santa hat from a blog called Denise’s workshop. 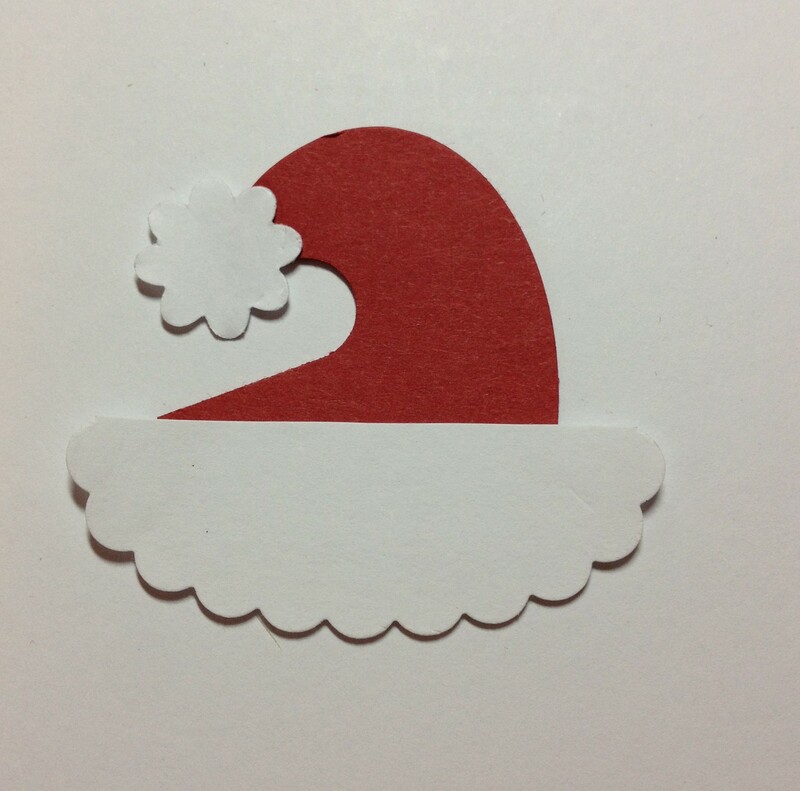 It took me a little while to figure out how to make the hat using the punches I have (all Stampin’ Up!) so I thought I’d show you how I made it. 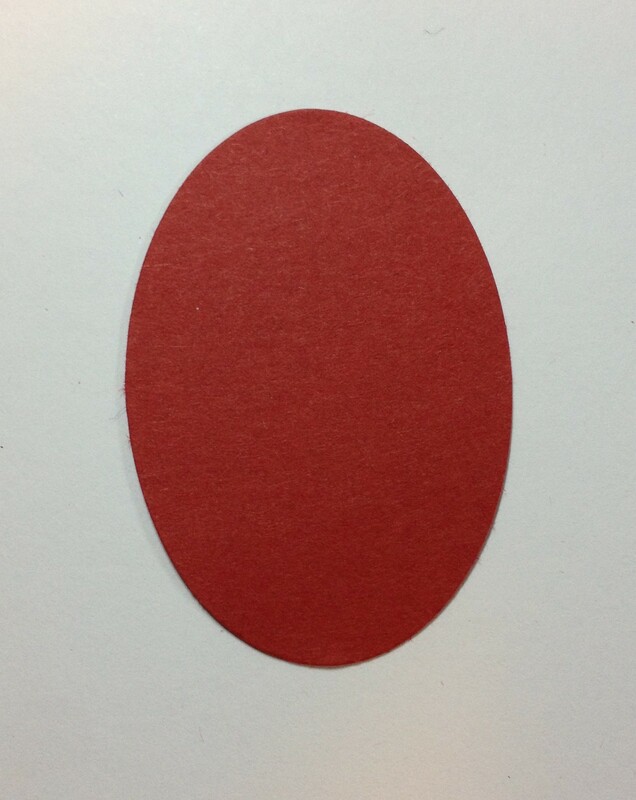 Tip: see how the cut where I trimmed off the bottom of the oval is not straight? I found when I cut straight across the bottom of the oval the hat itself ended up looking a little ‘wonky’. After a bit of trial and error I discovered it was better to hold the ‘fur trim’ across the hat and just judge by eye where the right spot to cut was. Each time I made a hat it was a bit different, as each time I’d punched the Word Window section at a slightly different angle. Stick on the trim and you’re done! I decided to use these as place settings for our Christmas lunch. They looked really cute all lined up together! 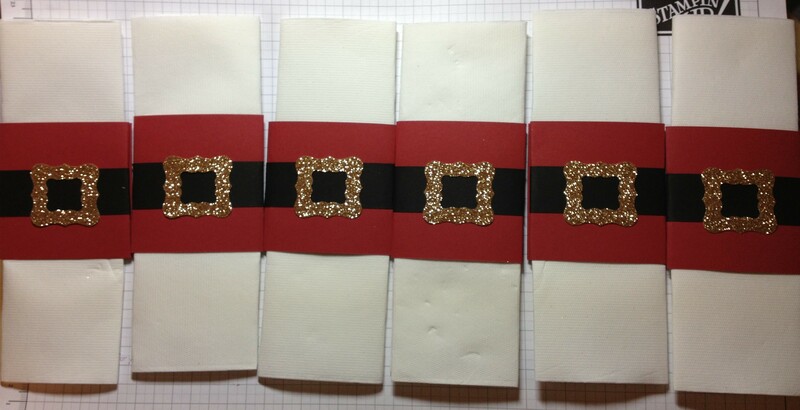 Hopefully this might inspire you for some Christmas craft a little later in the year.